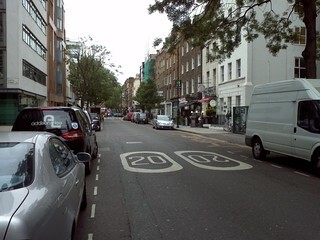 During the first half of 2012, LB Camden has carried out an extensive improvement scheme in Fitzrovia. That is the area bounded by Euston Road, Tottenham Court Road, and the Westminster boundary in Cleveland Street and Percy Street. This has provided plenty of essential additional north-south permeability in Whitfield Street and Charlotte Street. The implementation is ‘light weight’ in that it is done by means of signs and road markings: separation by kerb or by continuous white line is not considered necessary in roads with low traffic speeds and flows. The officer’s report indicates that the 85%ile speed is between 19 and 22 mph on these two roads. Whitfield Street for motors is 1-way southbound between Warren Street and Howland Street, 1-way northbound between Howland Street and Tottenham Street, 1-way southbound between Tottenham Street and Goodge Street. These alternations in direction are perfect for preventing rat runs, but made an otherwise quiet north-south street useless for cyclists. The scheme for two-way cycling involves installing ‘No Entry: Except Cycles” or “Two-Way cycling” signs at each of the seven junctions. In addition, cycle logos are pointed on the road to show the presence of contraflow cycles and where necessary (for example at junctions), lane lines are marked. 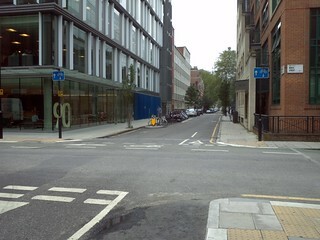 Windmill Street has a mid-point closure (with cycle access through) where it meets Whitfield Street. 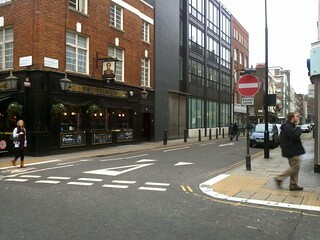 Windmill Street is two-way east of the closure. It is one way westbound from the closure to Charlotte Street. 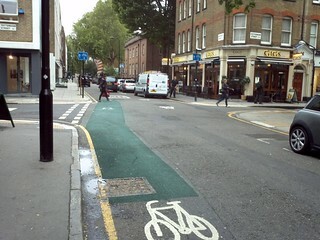 However, two-way cycling would be useful and presumably simple to implement. This is something that we overlooked before the consultation. 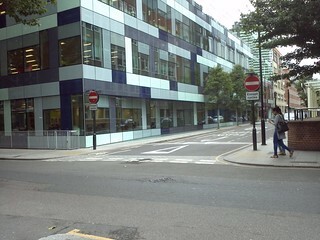 Tottenham Street has no entry at Tottenham Court Road, is 1-way eastbound between Whitfield Street and Charlotte Street; and 1-way westbound between Charlotte Street and Cleveland Street. There is a cycle hire station in Scala Street. 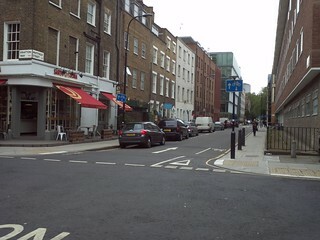 It should be simple to implement a lightweight contraflow scheme: on both sides of Charlotte Street. 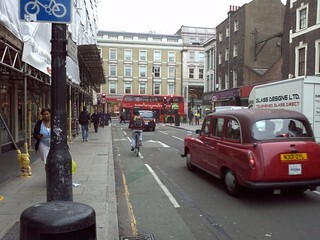 Some special measures may be required to provide entry for cyclist from Tottenham Court Road. We are disappointed that this has been omitted. 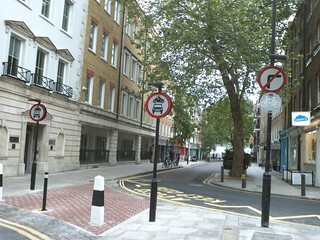 As the result of the provision of two-way cycling in Fitzroy Street and earlier changes at the southern end, it is now possible for cyclists to ride in both directions between Percy Street and Fitzroy Square. 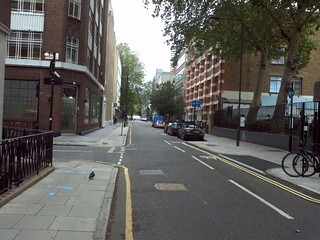 For motors, Fitzroy Street is still one way southbound between Fitzroy Square and Maple Street but cyclists are now allowed to ride northbound as well. The southern end used to be a false one way street southbound between Windmill Street and Percy Street and the latter was one way eastbound. 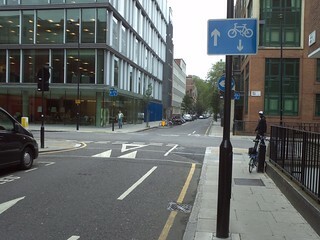 Westbound contraflow cycling was put into Percy Street in 2010 but at that time it wasn’t possible to turn right into Charlotte Street as there were two filter arrows at its southern end. 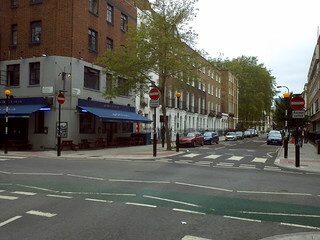 However, this changed some time in 2011 when a raised table was installed at the junction and it was made clear that cyclists can turn right. The change at the southern end of Charlotte Street completes a really useful east-west route along Guilford Street, Russell Square, Montague Place, Bedford Square, Bayley Street and into Charlotte Street. 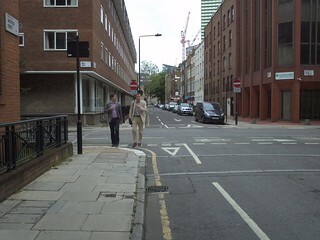 We have campaigned for a “SSL Relief route” for several years: that is, a route parallel to the Tavistock Place cycle route (or Route 0) along the streets just mentioned. A 20mph limit is indicated by signage. This supported by two new junction tables at the junctions at Charlotte Street/Tottenham Street and at Whitfield Street/Grafton Way. 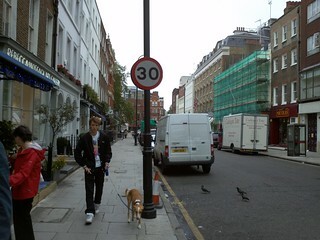 Charlotte Street: why change to 30 mph here? The 20 mph limit should extend the full length of Charlotte Street and also include Percy Street: why have these been omitted? They were included in the ‘Project Area’ for the consultation. 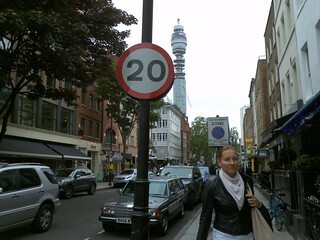 We have heard (Nov 12) that Westminster Council refused the 20 mph limit in thei rterritory. 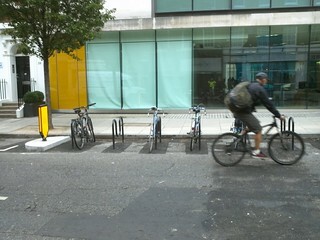 It is pleasing to see installations on cycle parking on the road in Percy Street and Whitfield Street. 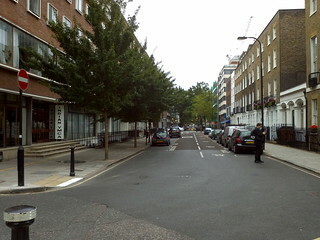 Cycle parking on the road first appeared in Bedford Square about six years ago. It is good to see some more at last. 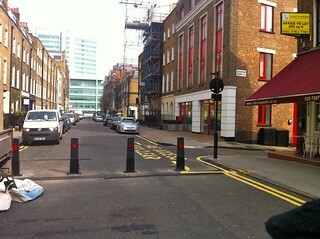 The signals have been removed at the junction of Charlotte Street with Howland Street and with Maple Street. See a separate report on these changes. 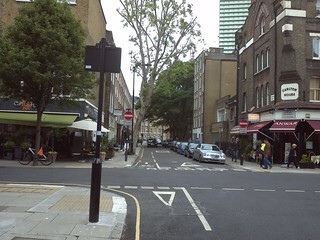 This scheme has done a lot to improve north-south permeability for cyclists in the Fitzrovia area and the 20 mph limit should improve safety for both cyclists and pedestrians. The new route all along Whitfield Street also provides useful connections with Route 0 in Howland Street and Maple Street. In addition, the route along Charlotte Street completes the western end of the SSL relief route. 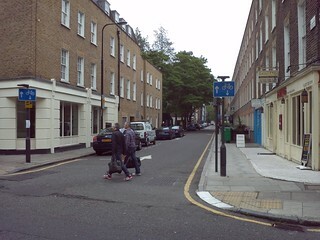 Regarding east-west permeability: we keenly await the implementations of the proposals for Warren Street. However it is disappointing that no other two-way east-west routes for cyclists have been agreed. 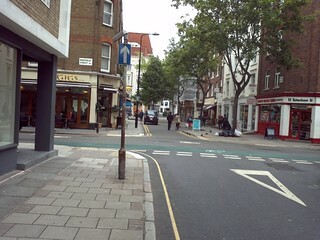 We urge Camden Council to add schemes for Windmill Street and Tottenham Street as suggested above. As a target for the future, it would be good to see collaboration with Westminster to make Cleveland Street two-way for cyclists. and then follow link from title. 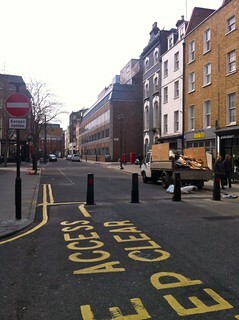 A closure has been constructed from bollards set across the road at the west kerb of the junction of Grafton Mews. 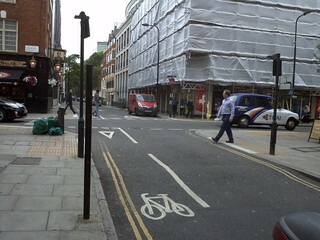 This is intended to prevent rat-running through Warren Street and the street now seems very quiet indeed. A short stretch of Warren Street between the barrier and Fitzroy Street has been made two-way to allow vehicles to turn round. We note that the sign shows that cyclists are allowed to pass the barrier westbound.